The Tri-Cities and its three major cities posted some solid Q1 sales numbers, and the folks in Bristol had something to crow about. According to ETSU’s Dr. Steb Hipple’s analysis, Bristol saw its fourth straight quarter of double-digit growth. On the surface the numbers look like growth at the Pinnacle is sucking the oxygen out of the region’s retail sales. But there’s another side that the story, and a major player that doesn’t show up in most media reports. When you look at the how much of the retail market Bristol, Johnson City and Kingsport command that player comes onto the field. And that player shared the double-digit Q1 year-over-year growth with Bristol. The lion’s share of Q1 retail sales (40.1% of the total) was made outside the three major cities. Of course, you have to consolidate all of those sales in those smaller areas to get the effect, but it illustrates the fact that there’s more to the region’s retail marketplace than the three hubs. It also shows there was some solid growth outside the core retail centers. The exceptions were Hawkins and Scott counties. 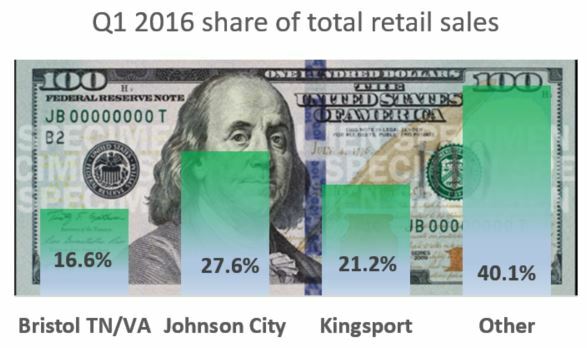 Johnson City remained the dominate city retailed in Q1 with a 27.6% share of all sales. This is nothing new. Johnson City has claimed the largest piece of the retail pie with shares that ranged from 30.2% to 27.1% on the low side for the last five years on Dr. Hipple’s Q1 report. Most quarters were in the 27% range. Kingsport weighed in with a 21.2% share. That proportion has also been consistent for the past five years. There’s no argument that Bristol is the big gainer when you look at year-over-year growth, but its share of the retail market high-point was 16.6% in Q1. Retail markets outside the major cities – I call it other on the chart – routinely claims the largest piece of the Tri-Cities retail pie. “The outlook for the future continues to be positive, but sill with some concerns. Retail growth is becoming stronger in the nation, but many analysts point to higher levels of household debt and fear this will constrain future consumer spending. The regional economy is plugged into the national business expansion, so any slowdown in the national economy would adversely impact regional business conditions as well,” he added.